The installation of the new bubbles began on Saturday, August 3. All the light fixtures, nets, divider curtains, etc. were removed from the North Bubble. On Sunday, August 4 the North Bubble was taken down. It was cut up into pieces and disposed of. Below are some photos of the work being done. Tool for cutting the cement grade beam. Making way for a new, wider passageway. It’s Wednesday, August 7. So far the weather has cooperated. Hopefully that will continue. The initial work of leveling the courts is almost complete. The new North Bubble is being delivered today. See below for a few more photos. Unloading the new bubble. All the way from Canada! Thursday, August 8 and there was some rain overnight with more expected tonight and tomorrow. Oval Tennis was unable to work on the courts today. They will need to wait until the courts dry before they can complete the job of leveling the courts. Below is a step by step photo documentary of the bubble being moved from the curb near the Tram to its resting place on the courts. This is one of two bundles which will be the North Bubble. This bundle weighs 6500 pounds. It took 12 men over an hour to move it into place. It’s Monday, August 12 and we’re finally getting some dry weather. We lost two days over the weekend because the courts were very soft from the rain and no work could be done. The crew from Oval Tennis, actually two crews, are hard at work finishing the job of leveling the courts. The current plan is to put up the new North Bubble on Wednesday with the courts ready for play on Sunday or Monday. Wednesday, August 14 and the courts are still too wet to put up the bubble. Tomorrow is the big day! Some work was done getting ready for the installation. Revolving door installed on Court 12. This will be the entrance to the North Bubble until work is completed on the South Bubble. It’s Thursday, August 15 and it’s another beautiful day! We deserve some good weather. The crew was here at 7AM ready to begin the work of putting up the bubble. The bundles you see pictured above are unfolded and the bubbles are spread out over the courts. First, however, layers of plastic are laid down on the courts to keep the inside of the bubble clean. The crew then unfolds the bubble and pulls it into position. The bubble is then secured with boards which drop into the channel around the perimeter. Once this process is complete, the bubble can be inflated. One very excited member of the crew! The bubble is up! At 12:30PM on Thursday the fans were turned on in the North Bubble. It took about an hour to fully inflate the bubble. There is much work to be done on the courts and with lights, divider curtains, etc. However, we have been assured that the courts will be ready for play on Monday, August 19. A dried up puddle on Court 12. It will look perfect before Monday! It’s Monday, August 19 and the new North Bubble is open! It’s so bright that you might need sunglasses inside. The first players on the courts were the Day Campers at 9AM. Meanwhile in the South Bubble, work has started taking down lights, divider curtains, nets, poles, etc. The plan is to get all of the work done inside the bubble today and then lower the bubble on Tuesday. As promised, it’s Tuesday, August 20 and the South Bubble is on the ground. The crews are busy cutting up the old bubble so it can be disposed of. Insulation has been removed from the liner and must also be disposed of. The pictures below were taken at just after 9AM. Everything you see was accomplished in about two hours. The crew is unbelievably efficient! The view from the lounge looking at Courts 1-3. Great morning light with our new Eastern exposure! It’s Monday, August 26 at 3PM and the new South Bubble is up! Below are some photos from today and from the past few days. 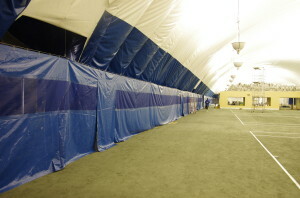 We expect to have some of the courts in the South Bubble ready for this weekend. Bubbles are delivered without openings for doors and passageways. Through a slit cut in the bubble, you can see the new passageway. Tuesday, August 27 and work continues. Jose and Victor are getting the courts ready for play – patching, leveling, adding HarTru, etc. Hang lights are being attached all around the bubble. We’re getting closer and closer to opening Courts 1-3. This reminds me of our years at Stadium Tennis Center in the Bronx when the bubbles went up in October and down again in April. You’d look at how much work needed to be done and think opening day would never happen. Slowly things would get done and then you’d be ready! It’s Wedensday, August 28 and things are looking really good! It’s raining outside, but that no longer matters. We think Courts 1-3 will be ready for the weekend and Courts 4-7 ready after Labor Day. Courts 1-3 are virtually ready to go. The walkway curtain has been installed, the lights are all working, and all that is left are a few small jobs. These courts should be open on Saturday, August 31. They look great!!! !